This is the first of several post that I’d like to write in the next weeks about investing in wind energy. There are several possible alternatives to invest in wind energy, or more broadly in renewables: stocks, managed funds, ETFs or even direct investment in the development of a project. The option described in this post (buy your own turbines) is probably the most extreme but it’s not unseen. I’ve been personally involved in several projects owned not by utilities, mega corporations or professional developers but by private investors or small companies willing to pay out of their balance sheet. Additionally, it has to be considered that the banks are usually willing to finance a relevant portion of projects. The percentage that can be financed is somewhere around 60% to 70%, in some cases even more. The capital cost of wind projects are dominated by the cost of the turbine. In this blog you will find quite a lot of post detailing the other costs associated with the project, usually called “Balance of Plant” (BoP). As a rule of thumb I would say that the turbines, fully installed and operational (that is, including transportation, installation and commissioning costs) will be somewhere between 60% to 80% of the total investment. How much does an industrial, multi megawatt wind turbine cost? It’s obviously not easy to answer this question as it’s dependant on several variables such as number of turbines purchased, transportation costs (marine and overland), financing, insurance and warranties, etc. Actually is so critical that companies in the wind business have usually specialized departments devoted to the gentle art of Pricing. 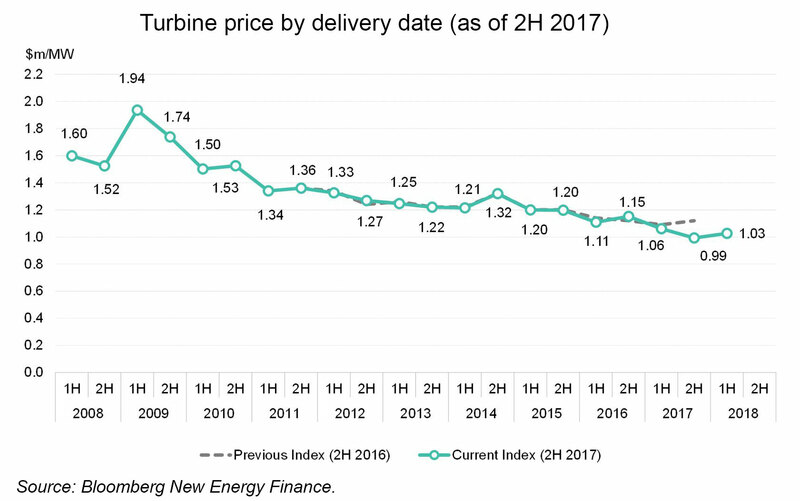 However several reliable sources (Bloomberg in primis - they are the source for the image above) are concordant on the fact that the cost per megawatt is steadily decreasing. When I joined the wind industry (2010) a MW was somewhere around 1.4 to 1.6 million dollars - that is, you could expect to pay around 3 ML$ for a 2 MW wind turbine. Today (end of 2018) prices have dropped dramatically. Buying a turbine today, with delivery at the end of the next year, will probably cost around 1 M$ per MW. There are several reasons behind this price drop. I believe that the main 2 are scale factor (today, 3 to 4 MW wind turbines are the norm while in the past the standard was 1.5 to 2 MW) and market pressure in the majority of developed markets (USA and Europe). To summarize, to invest in wind energy building your own small wind farm (1 turbine around 3MW, no substation or other substantial BoP costs) you would need probably between 0.5 and 1 ML$. This very rough estimate consider a total cost of the project between 3.5 and 4 ML$, with the banks financing around 70%. This entry was posted in Economics by Francesco Miceli. Bookmark the permalink.